Push off with your toes (#040) | Web comic "Surfer Joe"
Wait until the wave comes close… push off with your toes and dive in front of it. 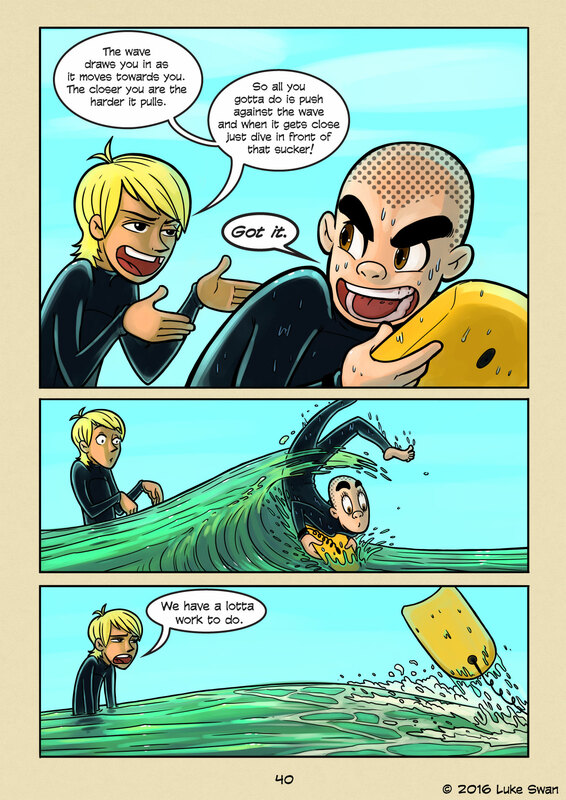 This is basically what my dad taught me to do on my bodyboard. There is this small beach next to my parents’ house that we used to play in as kids. It sits next to a bigger beach where all the surfers would ride the bigger waves. Our beach has two sets of tetrapods guarding it. They keep the waves small. Even though these breakers would chop decent swell down to ankle-knee high waves, I’ve always found them to be quite rideable. You can wade out with your bodyboard or soft top, wait for a wave to come and just push off into it. Often times these waves were closeouts, but as kids, we liked them that way. There would be a big elevator drop to the bottom, followed by an explosion as the lip crashed down on top of you. For a 9-year-old it is quite a wild ride. Sometimes when the conditions are just right the waves actually peel down the line. I noticed this in recent years, as I take my kids to this beach often and teach them how to catch waves. You can paddle into them pretty early on a long board or soft top. It’s strange because these waves are really small and don’t seem worth it at first glance, but are actually quite fun to ride. It’s pretty fun watching my daughters paddle into waves here. They’re pretty gung-ho and don’t give up easily, which is important when you’re learning to surf. In surfing, you fail more than you succeed. You have to get comfortable with failure and be undeterred in order to get the payoff of a good ride. I think it’s true with everything in life, but in surfing, failure is painfully obvious. Failure is not catching a wave you paddle for. Or blowing the takeoff. Getting stuck behind the section. Or catching a rail on a turn and falling off. But you can always paddle out for one more wave, another opportunity to get it right.